The Leroy R. Hassell Sr. National Constitutional Law Moot Court Competition draws teams from across the country. This year 23 teams competed from as far as California, Kansas, South Dakota, and New York. The problem was a mock United States Supreme Court oral argument. In the problem, two issues were granted certiorari. The first issue focused on the rationality of a statute that imposed licensing requirements on casket sellers in the fictional state of Clintonia. The second issue contemplated the Fourth Amendment implications of the search and seizure of a USB drive from the petitioner’s home by a private actor who then delivered the USB drive to the police. The team argued three times on Friday, twice as petitioner and once as respondent. The team advanced to the quarter-finals on Saturday, where it again argued as petitioner. 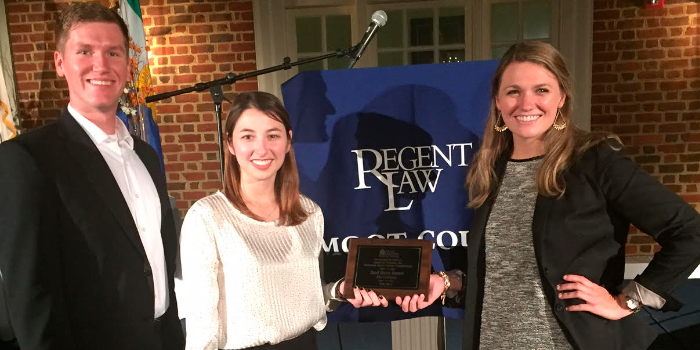 The team was knocked out in the quarter-final round, a round the judges labeled as “the best they had seen so far in the competition.” On Saturday, the team was honored for their quarter-finalist finish and also received an award for runner-up best petitioner brief at the competition. The team is very grateful to Professor Ron Wright for his support as the team’s coach. The team is also thankful for the students and faculty members who helped judge practice oral arguments.